In 2014, Nigeria’s economy witnessed immense growth, with a GDP of US$568.5 Billion, thereby becoming the largest economy in West Africa. This was attributed mainly to an unprecedented increase in certain industries, such as Telecommunications, Retail, Film and Entertainment Industry. However, in 2015 there was a seismic shift as the country was heading towards recession due to a crash in global oil prices. The state of the economy led the newly inaugurated Buhari administration to take certain far-reaching measures to revive the economy, as a crucial part of the government’s economic transformation policy in 2016, the Presidential Enabling Business Environment Council (PEBEC) was established to remove bureaucratic constraints to doing business in Nigeria and create a favourable environment for growing business; specifically the council has as part of its mandate the task of improving Nigeria’s ranking in the ease of doing business. On February 21, 2017, the council approved a 60-Day National Action Plan detailing actions to be performed by certain Ministries, Departments and MDAs. Starting a business- company name searches on the CAC portal has been introduced, a single incorporation form has also been adopted by the CAC to save time and reduce costs; documents can also be uploaded for submission on the CAC website, FIRS e-payment solution has been integrated into the CAC portal. Dealing with Construction Permits- there is an operational e-planning platform which allows tracking of applications, payment of fees and uploading of architectural designs. Getting electricity-there has been a reduction in the number of procedures and time lines at the Nigerian Electricity Regulatory Commission (NERC). Registering a property- sworn affidavits are no longer required at the registry and there is an on-going streamlining of the registration process. Trading across borders- the palletisation of imports has become mandatory to enable physical inspection of goods at the import, vessels importing into Nigeria are now required to provide an advance cargo manifest for risk assessment and cargo placement, the Nigerian Custom Service is required to coordinate physical examination of goods, certain agencies such as the Central Bank of Nigeria, Nigerian Customs Service (NCS) and commercial banks are now mandated to accelerate pre-export documentation procedures and there is a reduction in container placement notice time. Entry and Exit of people- The process for obtaining visa on arrival has been simplified including the submission process. There are new immigration regulations; arrival and departure forms have been consolidated, there is also 48-hours visa processing time, and other infrastructural improvements at the Abuja Airport. The National Assembly aligning with the objective of improving the ease of doing business launched its own initiative in 2016 called the National Assembly Business Environment Roundtable which is a partnership between the National Assembly and private individuals seeking to introduce legal and constitutional reforms in order to facilitate the ease of doing business in Nigeria. In its “Comprehensive Review Of The Institutional, Regulatory, Legislative & Associated Instruments Affecting Businesses In Nigeria”, it recommended the review of several Bills such as the Federal Competition and Consumer Protection Bill, 2015, Federal Roads Authority Bill, 2015, National Inland Waterways Authority Bill, 2015, National Roads Funds Bill, 2015, National Transport Commission Bill, 2015 and the Nigerian Ports & Harbours Authority Bill, 2015, Nigerian Postal Commission Bill, 2015 and establishment of a Federal Legislative Clearing House for cohesion and consistency. Transparency-MDAs were directed to make information on the procedure for obtaining licences, permits and approvals including fees and timelines immediately available to the public in their premises and on their websites. Default Approvals- MDAs were directed to ensure that approvals are communicated in a timely manner to members of the public, failure to do so will result in the application being deemed granted. One Government- this was introduced to facilitate cooperation between MDAs in the event that a customer requires input requirements and documentation from another MDA. Entry Experience of Visitors and travellers- Ordinary visas and tourist visas are to be issued or rejected within 48 hours. A list of visa requirements should be provided, regarding port operations- all agencies represented at the ports have been advised to streamline their operations into a single interface and Apapa port should be operating for 24 hours. Importantly, each Port in Nigeria has been directed to designate an existing export terminal for the exportation of agriculture produce. Other Executive orders aim to address the following pertinent issues namely, timely submission of annual budgetary estimates by all statutory and non-statutory agencies, including companies owned by the Federal Government, support for local content in public procurement by the Federal Government and improve local content in public procurement with science, engineering and technology components. 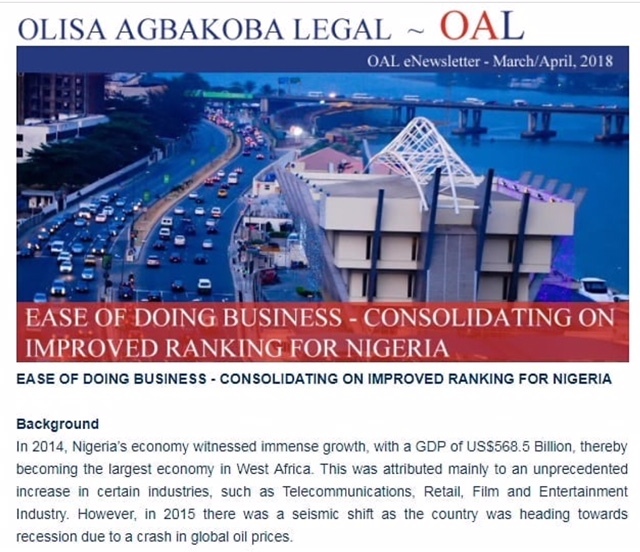 Undoubtedly, the reforms introduced by the government led to an improvement in Nigeria’s ranking in the Ease of Doing Business. On November 8th 2017, the World Bank Country Director, Rachid Benmessaoud, presented the Report on the Ease of Doing Business to Vice-President Yemi Osinbajo, according to that report; Nigeria moved up by 24 points from the 169th position on the 2017 ranking to 145th and was included in the 10 most reformed economies. What is the Ease of doing business? The report using Lagos and Kano as case studies states that it would take approximately 15 days to register a company in Nigeria. Specifically, for a private company it would cost N5000 for every 1Million share capital. Additional costs include: N 500 for incorporation forms, N 3,000 for certified true copy of Memorandum and Articles of Association, N 2,000 for certified true copy of form CAC 1.1. On average lawyers would charge N60,000.00 for incorporation depending on the size of the firm. Companies are also required to register at the Federal Inland Revenue Service; this can be completed in one day according to the report. Building and Construction Permits: In Lagos, obtaining the relevant licenses for a new building according to the report would take approximately 116 days and cost approximately N6.4 Million to complete. In Kano however it would take about 91 days and cost about N377,566. Getting Electricity: To calculate the cost of obtaining electricity in Nigeria, the report uses a warehouse as a case study. The process would be completed in at least 166days and cost approximately N336000. In contrast, in Kano it takes about 94 days and costs about N328000. Registering Property: According to the Ease of Doing business report registering a property in Lagos takes 76 days and cost approximately N2,723,874 Million but in Kano it takes about 45days with a charge of N3,182,347 Million. Getting Credit: This indicator measures the effectiveness of the credit reporting systems and collateral/bankruptcy laws in Nigeria. Concerning legal rights Lagos scored 10 out of 12 while on the depth of information about credit, it scored 8 out of 8. Paying Taxes: The Ease of Doing Business report considers the taxes a small or medium sized company would need to pay annually. The findings are that in Lagos about 59 payments need to be made yearly requiring a total of 366 hours. Trading across borders: The report considers the time and cost implications of exporting and importing goods. The procedures examined in detail include documentary compliance, border compliance and domestic transport. Additional parameters include the availability and status of implementation of Electronic Data Interchange (EDI) and Single Window (SW) systems. According to the study it will take at least 135 hours to export and cost approximately $786. Enforcing Contracts: The amount of time spent resolving a commercial dispute from the court of first instance and the quality of the judicial process is another indicator examined in detail in the report. It concluded that in Lagos a claim with a value of N1,010,472.00 instituted at the Magistrate Court would be resolved in about 447 days and cost at least N424,398. Irrespective of the fact that significant strides have been made in the ease of doing business in Nigeria, a lot of work still needs to be done by various government institutions and agencies. First and foremost infrastructural deficits need to be addressed for example the Apapa Gridlock caused by bad roads and unruly behavior of tanker drivers has had an adverse impact on the import and export industry. In spite of the executive order on the decongestion of the ports there is still a long way to go. Port congestions and delays have made it difficult for parties to meet their contractual obligations and foster corruption at the ports. 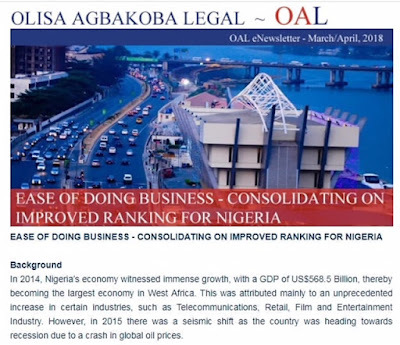 Importantly, to ensure the sustainability of the ease of doing business reforms, the National Assembly should quickly pass the Omnibus Bill which consolidates all the ease of doing business reforms by providing a robust legal framework. In addition, Government should mitigate the cost of doing business. For example in Lagos there are issues of multiple regulation and taxation specifically, the new Land use Charge Law seems to be worsening the situation. Going forward a uniform fiscal policy that is investor friendly should be applied to all states. Finally, there needs to be a drastic change in the area of settling disputes. To this end, government should design and implement proper case management procedures in the various courts; furthermore modern infrastructure is urgently required at all levels. Concerning arbitration, there should be a limit to the challenge of arbitral award in the courts this can be done by conducting an enlightenment campaign for judges on international arbitration.